In 1860 in the small town of Sonvilier, Switzerland, Louis-Ulysse Chopard realised the power of detail. And through his dedication to creativity, quality and audacity, he established one of the most respected companies in the world - Chopard. Renowned for their precision and pure inimitability, Chopard’s watches, jewellery and accessories are in a class of their own. 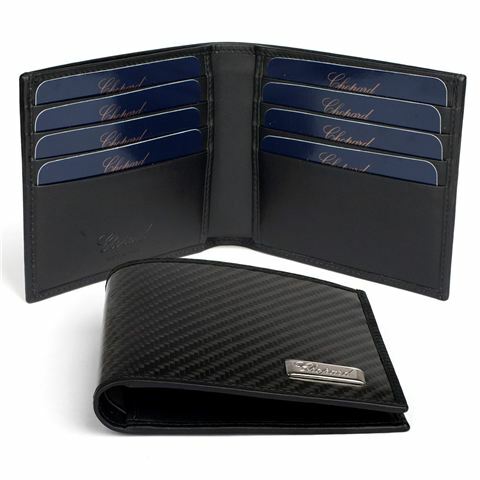 Classic yet contemporary, the Carbon Collection Wallet pays homage to Chopard's long history of involvement in motor sports - which is known for utilising carbon for its high strength-to-weight ratio. With its combination of classic contours and innovative blend of calfskin and carbon, this unique wallet is transforms the world of luxury leather goods. The smooth luster of the wallet's textured surface is as much a pleasure to touch as it is to look at, while the inside of the wallet boasts plenty of room for your everyday essentials - with eight credit card slots, two open pockets for notes and two side compartments for coins. Its compact size also makes this wallet a portable companion, which you can simply slide into your back pocket while you're out and about. The Carbon Collection Wallet - as essential as it is elegant. Made from calfskin leather and carbon fibre. Two open compartments for notes, as well as two side compartments for coins or receipts. Crafted to perfection with a strict attention to detail. Carbon fibre finish on the exterior has a two-tone effect. Beautifully presented in a suede pouch and then packaged in a Chopard gift box.